A mini ice age that would freeze major rivers could hit Britain in less than two decades, according to research from universities in the UK and Russia. 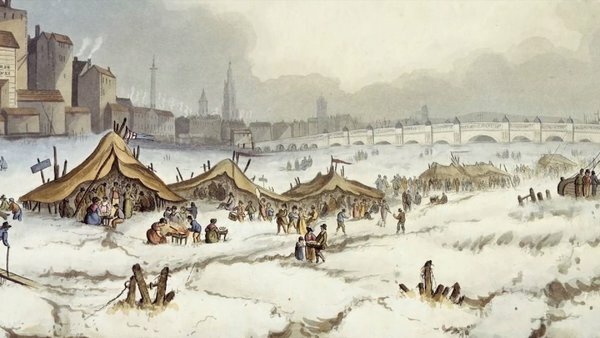 Professor Zharkova claims 97% accuracy for the model which dovetails with previous mini ice ages, including the Maunder Minimum period from 1645 to 1715 when frost fairs were held on the frozen Thames. But she cautions that her mathematical research cannot be used as proof that there will be a mini ice age this time around, not least because of global warming. "I hope global warning will be overridden by this effect, giving humankind and the Earth 30 years to sort out our pollution," she said. The most important takeaway point is that the scientific research is clear – were one to occur, a grand solar minimum would temporarily reduce global temperatures by less than 0.3°C, while humans are already causing 0.2°C warming per decade. Est-ce que c’est à mettre en perspective avec ça ? Oui ça doit pouvoir être vu comme une dernière manifestation de ce « mythe » du refroidissement bien alimenté par ce blog. What were climate scientists predicting in the 1970s ?